CSX'S NEW $60 MILLION PITTSBURGH INTERMODAL RAIL TERMINAL: Located in McKees Rocks, Pennsylvania, the facility opened September 7. 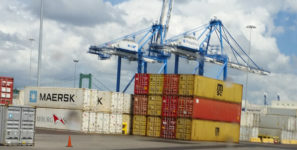 Double-stack trains are now connecting Norfolk Harbor and Pittsburgh. CSX’s National Gateway route connects Norfolk and Pittsburgh. CSX’s National Gateway Initiative connects East Coast markets to the Midwest. The Port of Virginia is now offering access into Western Pennsylvania and Northwest Ohio via CSX’s daily rail service to Pittsburgh. Double-stack trains traveling between the Norfolk Harbor and Pittsburgh will move along CSX’s National Gateway route to the rail carrier’s new $60 million Pittsburgh Intermodal Rail Terminal. The terminal is located in McKees Rocks, Pennsylvania, and opened September 7. The Pittsburgh terminal is the last piece of CSX’s National Gateway Initiative, which is an $850 million project focused on creating a network double-stack rail and intermodal terminals that connects East Coast markets to consumers, manufacturers and businesses in the Midwest. In fiscal year 2017, which ended June 30, 2017, the port moved 569,000 containers by rail, more than an 11-percent increase in volume when compared with fiscal year 2016. Containers will be accessible around-the-clock at the 70-acre intermodal terminal, which is located at 1000 Intermodal Way, McKees Rocks, Pennsylvnia 15136.